For a golfer (or someone who likes to think of themselves as a golfer), living up north is not the most ideal location to be, so when my company offered me the opportunity to move south to the Charlotte area... I jumped at the chance. Golfable weather 10+ months out of the year as opposed to only about 6 months of the year? Sign me up! While in New Jersey, I spent a bit of time playing with some different competitive clubs and, when I had the opportunity, I played in a few club championships and county-run tournaments as well. I've been as high as a 23.8 official handicap and as low as a 16.3 official handicap... but I've always had a desire to be far more competitive and to be able to play more consistently. In all the tournaments I'd ever played in, the closest I came to a win in a big way was a runner-up in the 2009 Flanders Valley Club Championship C Flight. I qualified and then made my way through 3 rounds of match play before I fell apart the 36 hole championship match, losing 6 & 4. I moved down to the Charlotte area in December of 2013 for work and I had the opportunity to play some decent courses in the area. Some have been far nicer than others, but... overall, the quality of the courses down here leads me to believe that I've got to find a way to play more of them. I've spent a good amount of time thinking about how I miss the competition of the game and I had made the decision a few days ago to get back to playing some competitve (by high-handicap amateur standards) golf, so I began looking into joining a club or tour that plays in the area. I found the Golfweek Amateur Tour and decided that, come 2015, I want to be a member. So... with that in mind, I made a plan to start getting myself ready for the season by trying to get my swing somewhere close to what it was when I was at my lowest handicap. The easiest way to do that is to get myself back out on the course. The few times I had played between December and now, I was shooting between 95 - 105, on average, so I knew not to expect too much from myself. My goal is to be shooting somewhere in the high 80s to low 90s by the time the season rolls around in February of 2015. My first round on the road back to playing some competitive golf was also my first 18 hole round in almost 4 months. 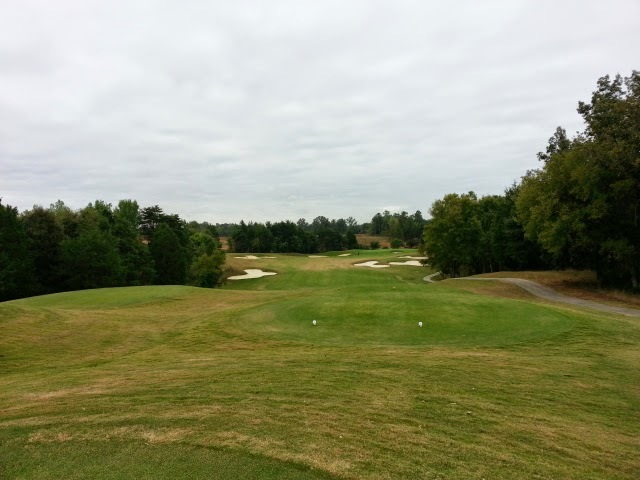 I decided to stay local and to try a new course, so I settled on Regent Park Golf Club in Fort Mill, SC. I didn't have a tee time, but it didn't appear based on available times that the course was going to be busy... so I took the short drive and walked on. They were starting everybody off of the 10th tee, so... after hitting a few putts on the practice green, I headed to the 10th tee to begin my day. A fairly easy opening hole, if you're playing well. I knew a decent drive would set me up in a good position, but... unfortunately, my driver leaked right and then rolled down the slope into the woods. My provisional was also right, but hung up in the rough. Luckily, I was able to locate my original ball and punched it out of the woods into the rough on the right side. I had about 210 yards to go from there but I topped and pulled a 4 iron out of bounds. I hit another from there, poorly. This left me a pitching wedge which I left right. I putted on from just off the green and needed 2 putts from 9 feet to card a quadruple bogey 9 to start my day. This was one of my few good holes for the day. A trap at about 250 yards up the left side was my target. I hit a pretty little 3 wood from the tee that ended up about 10 yards short of the trap. I took a way-too-easy swing with a gap wedge that hit the green and spun off. I then putted from off the green and left myself about 16 feet to the hole. I dropped that for a par to settle down a little bit. I had a bit of a wait on the tee here because I had a slow group ahead of me, so... I visualized my shot from the tee and then I ALMOST executed it perfectly. I wanted to play a slight fade (which is my natural shot) off the right side of the pond that sits about 280 yards from the tee. It started off where I aimed it and BARELY faded back. It got caught up in the rough just to the right of the pond leaving me a ball sitting above my feet. I made a horrible swing and the ball splashed into the pond about 20 yards in front of me. I dropped back at the original spot and hit an equally poor shot with an 8 iron that stuck out right and landed in a greenside trap. 2 shots to get out of there (poor lie and a poor swing) and then another shot from off the green that landed on the fringe. Another putt from off the green and 2 more putts from 10 feet... and I posted a 10. The rust (both physical and mental) was evident. This hole was not one that looked appealing to me. It was uphill from the tee to the green... a hazard short and left. Traps beyond the green and to the left. It just looked like trouble from the start. My 5 iron was fat... and it ended up well short and right in a valley well below the green. My sand wedge 'flop' did just that... it flopped. My chip got caught in the fringe and my putt from off the green (for the 4th straight hole) settled 1 foot from the hole. I tapped in for a double bogey 5. We'll call this one Bunker Town. A short little par 4 that's laced with bunkers everywhere. From the tee, there's a very wide-open piece of fairway about 200 yards out. I had already hit a couple of poor long irons, so I pulled my 18 degree hybrid out. The ball started right and stayed right... and ended up in the 2nd of 3 bunkers up the right side of the fairway. I hit a horribly fat gap wedge from there that ended up in the rough on the right and then landed my sand wedge 30 feet from the hole. 2 putts from there and I finished with a bogey 5. More troubles from the tee here as I blew a driver way right and out of bounds. My provisional was also right, but it stayed in play. I hit a good, solid 4 iron from the rough and left myself about 100 yards from the center of the fairway. I had about 90 yards left, but it was slightly uphill and into a bit of a breeze, so I took a soft swing with my attack wedge, but it ended up left of the green in the fringe. I putted from there to a foot and tapped in for a double bogey 7. Playing with a natural fade, my favorite holes are doglegs to the right. This set up beautifully for me. I hit a good shot with my driver that got caught up in the wind, so it went much shorter than I had hoped... but, I was in the center of the fairway with an easy shot to the green. Predictably, I skulled my 8 iron, which never got more than 3 feet off the ground. It ended up in the bunker short and right of the green. I hit a good shot from there to 9 feet, but couldn't convert the putt so I settled for another bogey. Unlike the previous par 3, this one played to my eye. It was slightly downhill from the tee, and the pin was way back, away from the pond that fronted the green. I hit a smooth 6 iron that faded beautifully and hit softly on the green. Unfortunately, it landed on a slope and spun further away from the hole. The birdie putt from 33 feet was just to the right, so I tapped in for my second par of the day. As finishing holes go, this is not an overly difficult one. I managed to MAKE it difficult, but... if I played it in a normal fashion, it was pretty straight forward. As I said... I played it in a way that made it much more difficult than it needed to be. I lost my drive... to the right... again. Next one also went right, but stayed in play. I hit a decent 4 iron from there, but it ended up well short. I pitched on from there and then, from only 8 feet, I had my first three-putt of the day. I finished my front nine with a quadruple bogey 8. As I made the turn, I suddenly found myself behind an extremely slow-moving foursome. I was worried that I wouldn't be able to get in the entire nine holes, but... I figured I'd give it a shot. If this was my first hole of the day, I'd have probably opened with a 14 or something crazy. A dogleg to the left with a green fronted by a crossing hazard. I flat-out sliced my 3 wood into somebody's back yard... then hit another one really, really close to their yard. I had 204 yards to the green... with a blind shot up over the fairway and down to the green. I pulled it way left with my 18 degree hybrid and then chipped on to 18 feet from the rough. 2 putts left me seething with a triple bogey 7. Standing on the tee waiting for the green to clear... I had one thought in my head. "Don't hit it fat and put it in the hazard." Not the best thought to have on the tee, for sure. Well... I definitely didn't hit it fat. I bladed a 6 iron that stayed about 6 feet in the air the entire time before it crashed into the rough short and right of the green. I hit a decent chip to about 5 feet... then completely choked and settled for a bogey. This is one of those risk-reward holes that you can take off a huge chunk of yardage by playing it up over the trees on the left side as it was a severe dogleg to the left. I aimed for the tree just off the left side of the fairway, figuring it would fade off of that and and up in the middle of the fairway. It wouldn't give me a shot at the green from there, but... it would put me in a good position. Of course, I pulled my driver and it was the straightest shot I hit all day. It crashed into the trees and fell straight down. I had a decent size opening to punch a 5 iron out of, which would have left me about 100 yards to the green. Instead, I hit a tree trunk that was no thicker around than a baseball bat and it bounced into the fairway about 160 yards from the green. A poorly struck 6 iron forced me to chip from right of the green and then I needed 2 putts from 7 feet for a bogey. The second straightest shot I hit all day was on this hole. With some wind in my face, it was the perfect distance for my 5 iron. I aimed it at the trap to the left of the green... and that's where it stayed. Unfortunately, I hit it well enough that it cleared the trap and kicked off the mound behind the trap settling in the water hazard. I over-compensated on the next swing and sliced my shot well right of the green. 2 more swings from there and a 3 foot putt meant I was posting a triple bogey 6. At this point, I all but knew that breaking 100 wasn't going to happen for me, so I concentrated on trying to make some good swings. My driver didn't fade back like it had been, so I ended up in the rocks up on the left side. I was forced to chip it out into the fairway from there. I hit an ugly gap wedge that came up short of the green from there and then it got really bad. A chip onto the green... and another three-putt from only 8 feet. My second of the day from that distance. The triple bogey 7 really got under my skin. On this hole, the group ahead of me was in the fairway when I reached the tee. They waived me forward to play through. I stepped to the tee and hit my drive... but I immediately lost it. I thought the ball had exploded because the contact was so pure that I didn't even feel it. I vaugely saw something come down on the left side of the fairway, but I wasn't sure if it was my ball or not. Because I was playing through, I didn't want to hit a provisional to hold them up... so I headed up the fairway to thank them for their politeness. I then asked if they had seem my ball to which they all waived that it was 'way up there'. I spotted my ball and when I got to it, I was amazed. I was 2 yards in front of the marker labeled 172 yards to the center of the green. I had absolutely killed that drive. Because I hadn't planned on playing, my GPS wasn't charged... so I didn't get to measure any of my drives, but... based on the distance it stated from the tee on my GPS (527 yards) and the fact that it was a very slight dogleg to the right while my ball was on the left side of the fairway... I'd say it was a 325+ yard drive. One of the furthest I ever GPS measured was a 299 yard shot on a very dried out par 5 in May of this year. This was well beyon that... so, my aggression from playing so poorly was taken out on that shot. I still managed to mess it up. I dunked my 5 iron from there into the hazard short of the green... then wedged on after my drop and finished with 2 putts from 24 feet for a bogey. A short, fairly benign little par 3. I hit a nice, smooth 7 iron to the middle of the green and then, for the 3rd time, I three-putted. This time from 25 feet. I was forced to settle for a bogey after a nice start. By the time I got to the tee here, I was done. I caught up to the next group and needed to wait. Then, the maintenance guy was in the fairway oblivious to the fact that I was on the tee... either that or he knew that's where he was safest. When I did finally tee off... my ball went so far right that I don't even know if it hit trees before it was off the property. My 'provisional' landed in the fairway and left me 198 to the green. I dropped my 4 iron from there into the greenside bunker and then smacked it out of there to within 20 feet. Of course I wasn't going to make anything from there with how I had been putting, so... I needed two putts to card a triple bogey 7. As I said above... I was done. I just wanted to finish. I had lost more balls than I cared to count. My score was growing to near pitiful numbers. I just wanted to go home. My drive was right, but stayed in play. From the rough, I had about 110 to go and hit an abysmally fat pitching wedge. My pitch from the fairway was short and I putted from off the green. I was 12 feet away and, to close out my day, I finished with my 4th three-putt of the round. The result was another triple bogey. It was pretty much what I expected. A round that showed me how rusty I was. A round that showed me that I need to work on putting... a lot. A round that showed me that, even if I could hit the ball out there at times, it wasn't going to matter if I was hitting the first drive into the woods somewhere. Overall... it was on the same level that I had been playing on. I've got a long way to go to get myself back into the high 80s to low 90s on a consistent basis.